Earthworks Farm: What's on the Needles? These are Jason's DIS-matching socks. They were specifically ordered, and named by him. One red, one orange, and the toes and heels made out of leftover rainbow yarn from my last pair. Have I mentioned that my son is NOT afraid of color? These are made out of old stash yarn; Knitpicks Stroll, I believe, in Firecracker Heather, and Harvest. 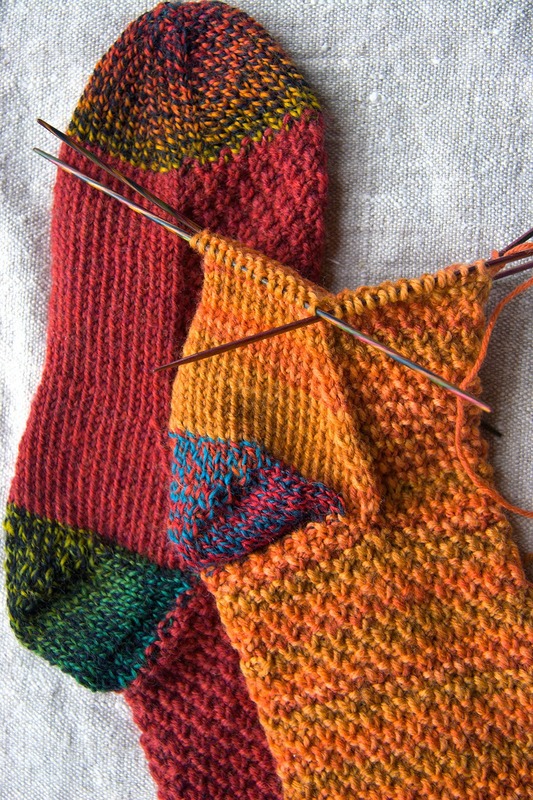 The heels and toes yarn is Schoppel-Wolle's Crazy Zauberball in rainbow. The pattern is my own, based largely off of my very favorite basic sock pattern, Classic Socks for the Family, by Melinda Goodfellow. For more of my spinning, knitting, and weaving projects, you can find me here.